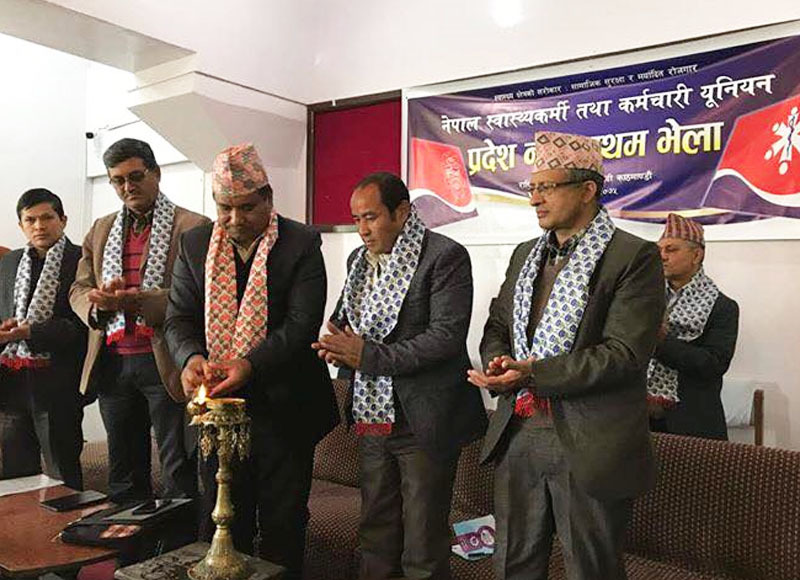 The Gathering of Nepal Health-work and Employees’ Union(NHWEU) of province no 3 has formed 13 member NHWEU province committee under the Presidency of Cde. Umesh Bartaula . The programme was inaugurated by Chief Guest GEFONT President Cde. Binod Shrestha . Inauguarting the programme, Cde. Binod gave the direction to union to focus on union expansion in all 13 districts of province no 3. President said, society gives the respect to the workers working in health sector but most of the health organizations have not follow labour law . On the occasion, GEFONT vice President Cde. Ramesh Badal highlighted on the provisions of labour law and contributory social security . GEFONT vice President Cde. Jeetendra Shrestha , NHWEU President Cde.Chandra Thapa ,GEFONT Province no 3 President Cde. Ramhari Nepal also addressed the programme.